Clayoquot Sound features miles of remote surf-swept beaches. 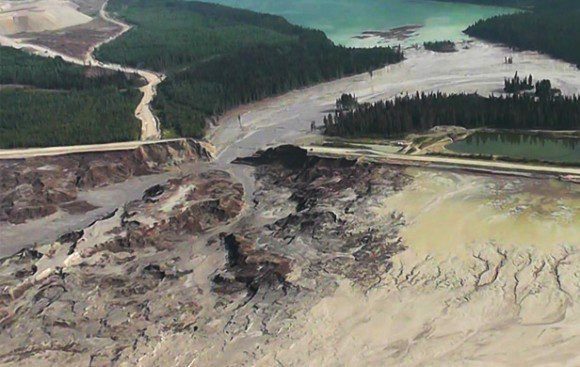 – Imperial Metals Mount Polley Mine Disaster from August 4, 2014. Photo: Common Sense Canadian. The legal action came after B.C.’s newly formed NDP-Green government announced it would not file charges before the August 4 deadline, stating that “an investigation was still ongoing.” This also presses the Trudeau government to enforce the federal Fisheries Act in the matter. Sellars filed charges under 15 counts: 10 under the B.C. Environmental Management Act and 5 under the B.C. Mines Act. The main charges relate to the dumping of contaminated mining waste into the environment and surrounding waterways, and to poor and unsafe operational practices, allegedly in violation of multiple permit conditions and general provisions of both Acts and associated regulations. Sellars, a grandmother of 3, believes her action could be a test for B.C. laws. – Bev Sellars and Jacinda Mack outside the Provincial Court of British Columbia in Vancouver. Photo: Bev Sellars. A private prosecution is an enormous amount of work, and this one is funded in part by West Coast Environmental Law’s Environmental Dispute Resolution Fund, but one of the conditions of their support is that the case be at least 30% funded by public donations.